Today at approximately 1:30 pm local time, Royal Princess experienced a power outage. Power is currently in the process of being restored, and in the meantime an emergency backup generator has been used to provide essential services, such as toilets. The ship is not in any danger, and the Captain has been keeping passengers regularly informed about the situation. The ship is currently on the seventh day of a 12-day Mediterranean cruise that departed Venice on September 15. There are 3,594 passengers and 1,336 crew members onboard. Since then Princess Cruises have announced that the remainder of the cruise (various ports of call between Naples and Barcelona) has been cancelled. Princess Cruises are taking responsibility for flying passengers home from Naples, on Wednesday, and various compensation packages are being announced. 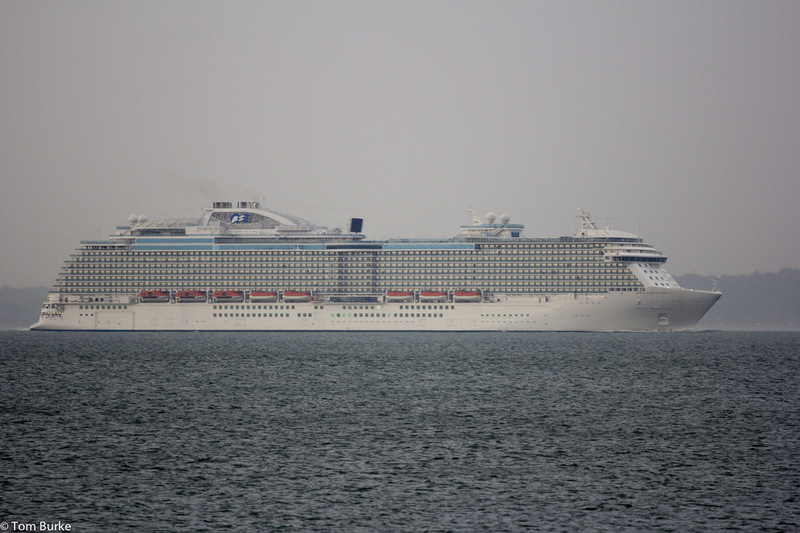 At the moment there is no statement about Royal Princess’ next cruise, due to depart from Barcelona on Friday. We are currently aboard Royal Princess sailing from Venice (15th Sept) to Barcelona (27th Sept). The new ship has experienced some problems. 21st Sept at 8pm when preparing to leave Mykonos, we were told by the Captain that the motor that operates the winch that raises the anchor had failed. That took some four hours to fix and required the replacement of the motor. The following morning the Captain announced that our arrival in Naples would not be affected as we had made good speed (23knots) through the night to make up the time. At 1:30 pm on 22nd Sept, all lights went out and the ship started to slow. The Captain was excellent in making regular announcements keeping passengers informed. Power to the cabins was restored about 5:15pm but we did not start to move again until around 9pm. We were told that the main switchboard had overheated and cut out and that efforts to move control over to the backup board was taking some time. The Captain said that we would not be able to make full speed when power was restored. This morning (23rd Sept) , when we should be docked in Naples, we have been told that the cruise will terminate in Naples so that engineers can do further investigations of the problems and get them fixed. We will dock this evening and passengers will be disembarked starting from tomorrow morning. Passengers have been informed that all will receive a FULL refund of the cost of the cruise and 25% discount on the next cruise they book. Arrangements are being made for passengers to be flown home from Naples, or flown to Barcelona and accommodated there (at Princesses expense) until their own onward travel arrangements. For me the most interesting part of that comment is this: “…We were told that the main switchboard had overheated and cut out and that efforts to move control over to the backup board was taking some time….“. So yet another power control / distribution problem. There have also been comments on the Princess forum on Cruise Critic to the effect that there have been a number of minor technical issues with this ship since she went into service in the summer; there may even have been an earlier power outage (on a different cruise). My wife and I were also on the same cruise. We would like to commend Princess Cruises for taking the high road with this unfortunate incident. One can only imagine the difficulty in securing flights home for almost 4,000 passengers, and having to bus everyone from Naples to Rome to catch their flights. Princess’ handling of the crisis was exemplary. Two days after we got home, we received a call from their Customer service rep inquiring if we made it home safely, and if there were any problems enroute. The rep also offered her personal assistance in making any additional claims for related expenses that we may have. In our case, we had booked online 4 additional nights in Barcelona post cruise and paid the full non-refundable cost of Euro 660. The rep has processed our claim and advised that we should be getting a refund of this amount in a few weeks’ time. Last week, I got my credit card statement in the mail, and when I checked it, Princess had already refunded me the full cost of the cruise – on the very day that we disembarked in Naples to go home! Talk about a class act!!! Of course, we were disappointed that the cruise was terminated midway, but based on our experience above, we’ll cruise with Princess any time! Tony, thanks for the comment. It’s good to hear how well the cruise line handled this.